Preparing the batter for these easy-to-make pancakes is as easy as making a smoothie! 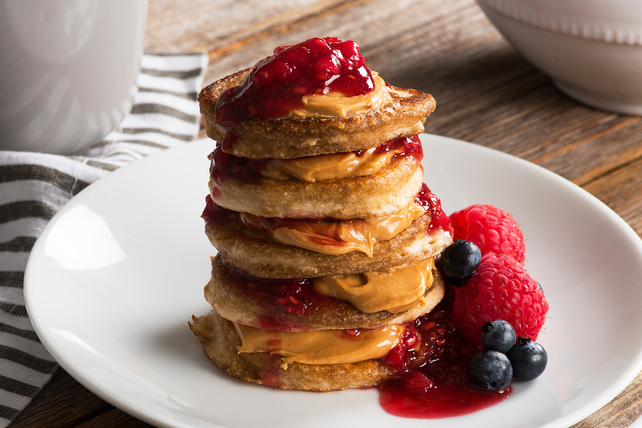 Fresh fruit and a bit of jam add the perfect touch of sweetness to these peanutty silver-dollar pancake stacks. Blend first 7 ingredients and 1 Tbsp. peanut butter in blender until smooth. Let stand 5 min. Heat large nonstick skillet on medium heat. Lightly brush some of the oil onto bottom of skillet. Spoon batter into hot skillet, using 1 Tbsp. batter for each pancake; cook until bubbles form on tops, then turn to brown other sides. Repeat with remaining oil and batter. Mash raspberries lightly with fork in medium bowl; stir in jam. Spread pancakes with remaining peanut butter. Top each pancake with 1 tsp. jam mixture. Stack pancakes on 4 plates. Secure each stack with short skewer, if desired. Spoon remaining jam mixture around pancake stacks. Cook pancakes as directed; cool completely. Refrigerate in airtight container up to 3 days. (Or, freeze in single layer in freezer-weight resealable plastic bag up to 3 weeks.) When ready to serve, reheat pancakes in microwave on HIGH 1 to 2 min. or just until warmed. Spread with remaining peanut butter, then continue as directed.